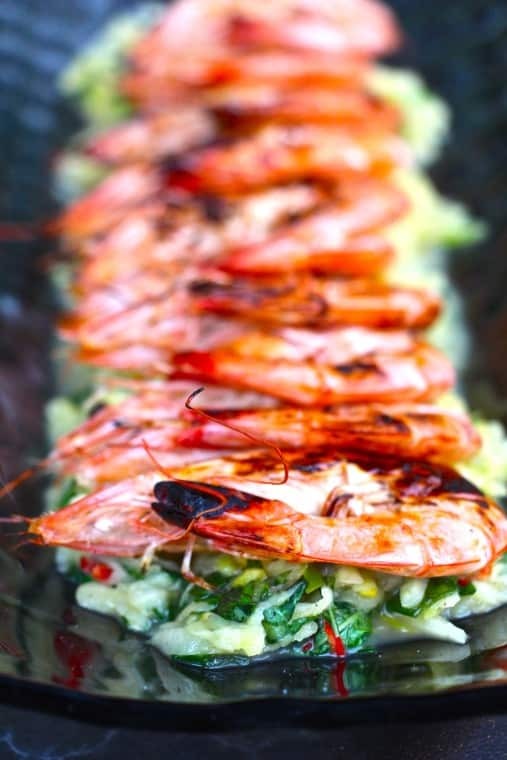 BBQ Prawns, Green Mango, Chili, Lime & Mint salad | Is Life a Recipe? Here they are. Nicely pinked, smoky and slightly charred prawns, sat atop a vibrant coloured and flavourful salad. Perfect combination. Very tasty. In the salad could go with anything to be honest. A pinch of baked ground pepper. Combine these in a bowl and then lay on a serving platter as I have done in the photo. A good pinch of salt and cracked black pepper. Again combine these in a bowl, give a astir and set aside to let the acid of the lemon start to slowly cook the prawns. If you can leave this in the fridge for about 2 hours that’s great but longer if possible. When you’re ready 2-3 minutes each side on a nice hot BBQ or grill. BBQ best because you get the smoky of the coals. Simply take the BBQ Prawns off then, allow them to sit a couple of minutes, before arrantly them neatly on top of the salad on the platter. And you can serve my friends. Tasted equally so, I heard. I did try the salad and oh yeah that was double nice!!! BBQ Prawns with Green Mango, Chili, Lime & Mint salad – Enjoy!!! No Replies to "BBQ Prawns, Green Mango, Chili, Lime & Mint salad"